Many of us have been tickled to see the Road Switch mentioned in the news around the world. From what I hear, it made the Wall Street Journal, Time Magazine, the New York Times, and was even mentioned on TV in Bahrain. What can I say? We’re a bunch of celebrities here. Send me $5 and a self-addressed stamped envelope, and I’ll send you my autograph. On Monday afternoon, my sister and I were walking home from Farmer Joe, and a car pulled into the CitiMart parking lot, which was literally roped off. The driver stuck her hand out the window and tried to hold the rope over her SUV, but it wasn’t working. So the girl in the passenger seat got out to hold up the rope. We were approaching from the driver’s side, so I held up the rope on my side. 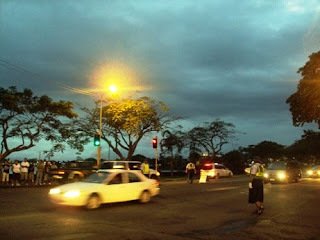 The car drove through, revealing the girl from the passenger seat: Miss Samoa 2008-2009. Sale of alcohol has been limited all week to deter driving under the influence during the Road Switch. Bars and nightclubs have been closed; even tonight they’re only allowed to be open until 10 p.m. It’s hard to know exactly how much this has affected the number of incidents since the switch, but it certainly couldn’t have hurt. I watched “Amelie” today. I never realized how stylistically similar it is to “The Royal Tenenbaums.” The two share the same sense of artistic direction, the use of a narrator, tangential cuts inserted into the narrative, cartoonish color saturation, and they’re shot with similar framing. And they’re both great. Tua brings up a good point regarding the Miss Samoa pageant. I guess it does make sense for a contestant to be interviewed in English to prepare her for Miss South Pacific. But I maintain this gives unfair advantage to competitors from abroad. I do think chicken-plucking would even the playing field pretty well. Anonymous asked which Miss Samoa contestant’s talent I thought was best. A week out, it’s difficult to pin down one. I liked Miss New Zealand interviewing herself. I thought Miss Australia’s motor bike was cool. Miss Siva Afi’s report on the nifo’oti and its role in siva afi was informative. I liked the contestant who mouthed the speech, and the song/dance numbers were staged well, as was the anti-domestic-violence tableau. Well done, all around. Supy left to visit the training village this afternoon. He tried hard to get me to come with him, but I’m on vacation, Supy. Maybe I’ll go next week. I finished season 4 of “Weeds” last night. That show went a little off the deep end, I think. I usually find it difficult to sleep past 8:30 a.m., but this morning I woke up at 10:40. I’m a little worried because I don’t want to wreck my sleeping patterns for when I have to go back to work next week, but I’m pretty proud my ability to sleep has become strong once more. Speaking of that, I think sleeping with the roosters has hardened my ability to sleep. Last Thursday morning in Faofao, all the other guests were complaining about the buses that drove by at 5:00 a.m. and apparently there was a car that idled and laid on its horn shortly thereafter. I didn’t hear any of it. This morning I ate the bowl of Raisin Bran Crunch my parents brought when they visited in May. Michael Palin would be disgusted to hear the flakes were still crunchy, but real cereal is so much better than Weet-Bix, it’s not even funny. Real cereal is expensive in Samoa, so that’s probably the end of that for a while. And that’s probably the end til tomorrow. I hope you’re well. 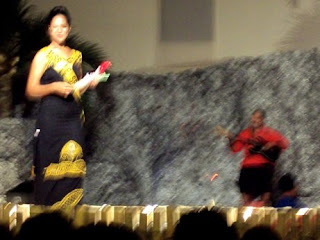 Saturday’s Miss Samoa post was easily the most popular since I started the blog. 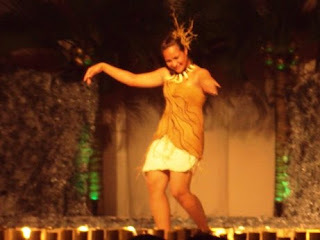 And in order to give the people more of what they want, more Miss Samoa pictures below. The winner. Jacinta. 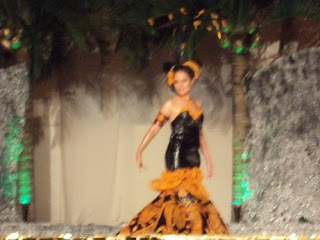 Miss Samoa 2009-2010. 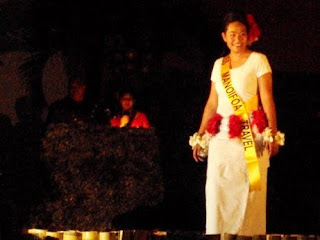 Contestant Miriama during the traditional wear portion. Unknown contestant (my apologies) in the traditional wear portion. Miss Samoa Australia during the traditional wear portion. Her dress design won for this category. Apologies for the blurry photo. 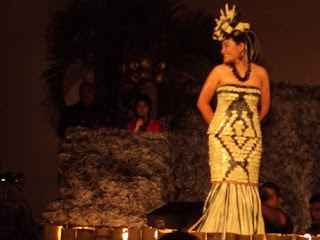 Miss Manoifoa Travel being introduced at the beginning of the evening. I agree with you on Weeds season 4 losing its way, but season 5 is so much better making it must see TV again. And keep posting pictures of the pretty ladies please. Matt, thanks for blogging. :) It is a great read. So, I was not expecting the cars and updated buildings posted in the pics for the road switch. Clearly, you are in a more modern area than I had thought. Nothing against the ladies, as they are beautiful, but I would like to see more pics of the buildings and sea/landscapes, if possible. I will have to watch season 4 and try to catch up on Weeds. Did you request Samoa when you voleed for the Peace Corps? Is it possible to request a location? i Love wheetbix!! put some sugar on and it's great (brown)!! our Canadian news reported the switch too - it's how i found out about it!! A proud Samoan moment for me too...although, not long after was the tsunami...a sad Samoan moment for me...i'm getting anxious to read about it and wanting to skip ahead. Weet-bix is real cereal hahaha I think I understand though because I used to loathe it as a child. I find eating it with a banana and plenty of milk makes it far more palatable these days.